1. Preheat the oven to 180°C/350°F, Gas Mark 4 (160°C for fan oven). 2. Place 8 paper cases in a bun tray. 3. Whisk the sponge mix with the oil (or 20g butter), water and egg for 1 minute until smooth. 4. Evenly divide the cake mixture into each cupcake case and bake for 12-15 minutes until firm to touch and golden brown. Allow the cakes to cool on a wire rack. 5. To make the buttercream icing add the softened butter and icing sugar into a bowl and mix until smooth (you may need to add 1-2 teaspoons of water to loosen). 6. Top the cakes with the butter icing (for best results use a piping bag). 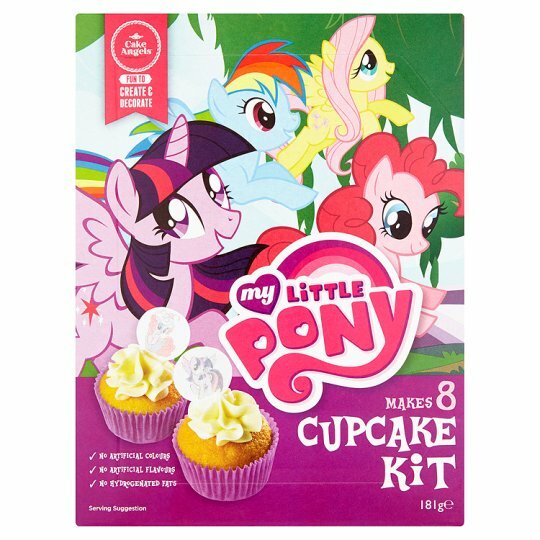 Complete the cakes with your My Little Pony wafer decorations. Enjoy your tasty cupcakes!